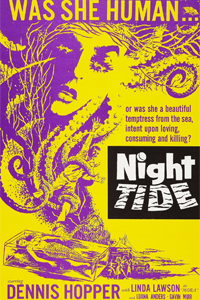 NIGHT TIDE (1961) was restored in 2008 by the Academy Film Archive with support from The Film Foundation and Curtis Harrington. Night Tide by Curtis Harrington was released in 1961 and is, like last week’s screening of Dennis Hopper’s The Last Movie, and ultra-rare 35mm print that has been made available to us thanks to the kind help of the Academy Film Archive along with support from The Film Foundation and Curtis Harrington. It’s been over 20 years since I’ve seen this film, but I remember being entranced by it’s particular spell and its beautiful black-and-white cinematography. I’m also a sucker for carnivals, freakshows, and – specifically – mermaids. Mermaids are the original femme fatale, and Lord knows I’ve dated enough of those to feel a kinship with all the sailors that have been lured to their doom. This time out the sailor is played by Dennis Hopper, and adding to the attraction is the fact that Night Tide was inspired by “Annabel Lee,” a poem written by Edgar Allan Poe. Producer and screenwriter Tod Davies will be present for an intro and question-and-answer after the film. Davies wrote the script for Fear and Loathing in Las Vegas, but long before that she was assigned the task of writing up a sequel to Night Tide, and she knew Curtis Harrington personally. Any film students who are interested in screenwriting should be sure not to miss this screening on Wednesday at 7pm only.